We received this note from a parent after her RSEC Academy student returned from their annual fall trip to NYC where they enjoyed dinner at Hard Rock Cafe New York and experienced Come From Away on Broadway. The two-day annual fall trip also included a visit to the Statue of Liberty National Monument and Ellis Island. 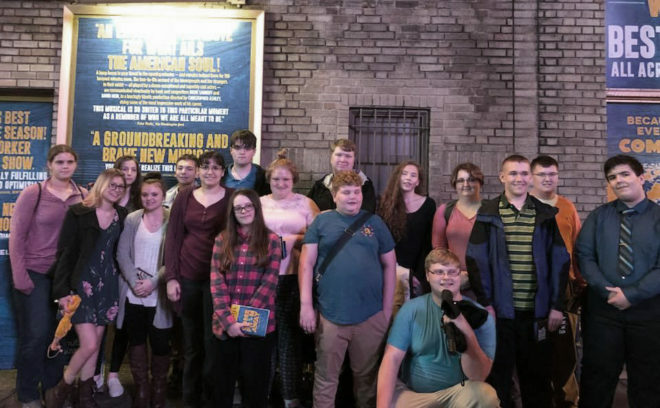 The students visited the 9/11 Memorial Museum and explored the city in all directions to add to the millions of stories already told about New York City. We’re so happy to hear about the victories – large and small – that happen every day with RSEC students. Thank you to this parent (names withheld for privacy) for sharing! And thank you to the teachers and staff who worked so hard to plan for this fall trip to make it educational and meaningful for everyone. Who was this kid that came home today?? My student could not stop talking about his experiences in New York. He talked the entire way home sharing every detail. Including how long it took the girls to do all their make-up and hair and how that this trip was stressful to the teachers as they had to make sure no one got lost. He absolutely loved the musical!! (the one thing I thought he might like the least). He said that when he saw the Statue of Liberty he got emotional. He shared the story behind the soldier on a horse at the 9/11 Memorial. This too was an emotional experience for him. He took everything in and had a fantastic experience. He did not have one negative thing to say. Needless to say, he has been in bed since 7:30. When I asked him about doing the activity that is tomorrow night till Sunday–he said after this trip I can get through anything. If he can make it through all this too after the week he has already had, I will be at a loss for words. Thank you for all the effort and hard work that went into this “Amazing” experience for our kids!! !